One of the best black and white photography tips you can ever get from a professional photographer is to shoot in color. Shooting in color gives you the flexibility of utilizing the power of colors. And with digital post-processing creativity is the limit. Digital post-processing opens up a wide array of choices and options for adding creative and artistic effects to your photographs. Check out for yourself! 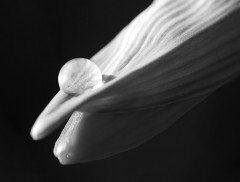 Here are 9 post-processing techniques for creating classic black and white in Photoshop. Black and white conversion with Photoshop is simple, quick and intutive. Let’s start with creating a black and white adjustment layer which retains the color information and also allows full control over how individual colors are converted. Open the selected image with Photoshop and go to Layer > New Adjustment Layer >Black & White. This creates a new layer and provides a color palette for fine-tuning the shades of particular colors existing in previous image. Click Auto or fine-tune the colors. You can also give a sepia tone to your image by enabling tinting and choosing subtle warm shade of yellow. Check out the tutorial here. 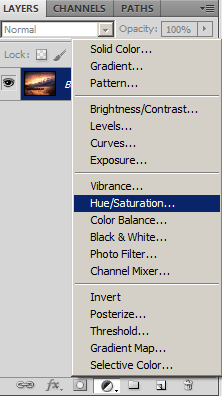 Open the image in photoshop and go to Layer > New Adjustment Layer > Hue/Saturation. Slide the Saturation slider all the way left. Play around with the Lightness slider to overexpose or underexpose the scene. Additionally, you can always tweak the exposure with the help of levels and curves. 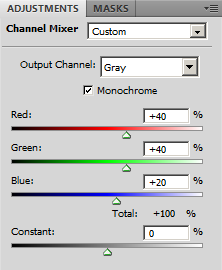 Go to Layer > New Adjustment Layer > Channel Mixer. Move the Red, Green and Blue sliders to left and right to lighten and darken the different tones of the photograph. Make sure that the total of the three sliders is always 100%. Other than desaturating the colors with Hue/saturation tool, Photoshop also provides a desaturate command which converts a color image to grayscale values while leaving the image in the same color mode. You can just press Shift+Ctrl+U or go to Image > Adjustments > Desaturate to convert a color image to black & white in one simple step. 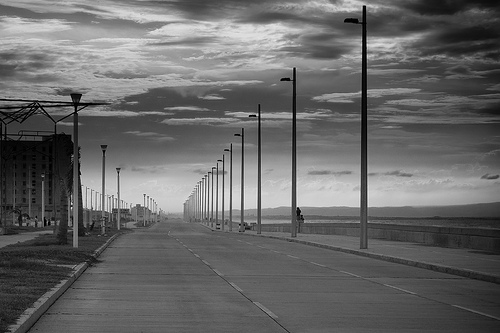 The gradient map is yet another useful tool for black and white conversion. 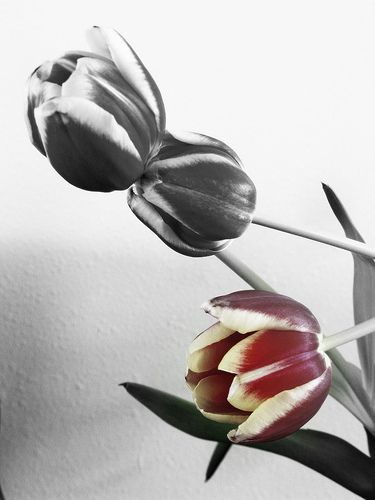 The gradient map tool maps black and white gradient according to the brightness values of the photo. The shadows in the image for instance are mapped to black or dark grey, highlights are mapped to white and the midtones are mapped to the gradations in between. Go to Layer > New Adjustment Layer > Gradient Map. Choose black & white gradient from the list of gradient fills (or set the default foreground and background colors as dark grey and white & choose Foreground to background from the list of gradient fills). The gradient map simply maps the dark areas to black or dark grey and highlights to white or light grey. This technique however doesn’t allow much control over fine-tuning the image. 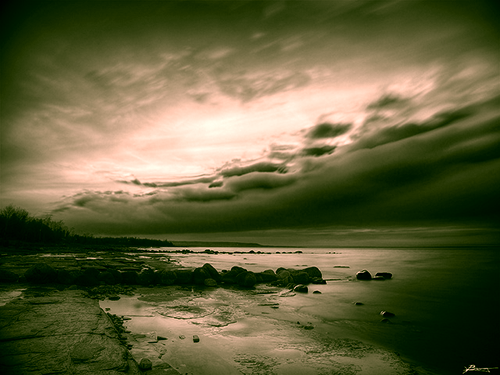 The grayscale image mode (Image > Mode > Grayscale) offered by Photoshop converts the colors in the image to black, white and shades of gray. However, this technique is destructive as it discards the color information and also you have no control over the conversion. Lab color method is yet another quick and simple technique. The black and white conversion with lab color technique results in a better tonal range. Try out for yourself! Here are the steps to convert the image to black and white with lab color method. Convert To Lab Color Mode: Go to Image > Mode > Lab Color. Select the Lightness channel from the Channels window (Window > Channels). Now select all with Ctrl+A and copy (Ctrl+C) the selection. Switch Back To RGB Color Mode: Switch back to RGB color mode (Image > Mode > RGB Color). Now go to the channels window and paste the selection to the individual channels; i.e. paste the selection to Red, Green and Blue channels individually. Preview The Results: Reselect the top channel and preview the results. If you are not impressed by the results go ahead and add Levels Adjustment layer to lighten or darken the photo. Black & White Conversion: Convert the image to black and white either by creating a black and white layer or desaturating the colors by dragging the Saturation slider all the way left (or by any other technique). Apply Split Toning: Add a Color Balance adjustment layer (Layer > New Adjustment Layer > Color Balance). Now adjust the color sliders for Shadows and Highlights respectively. Play around with the sliders till you achieve the desired effect in the image. The appeal of classic black and white images is unbeatable. However you can always apply some creative techniques to enhance the beauty of monochromes. Selective colorization for instance infuses the tenderness of colors in the nostalgic world of black and whites. Here’s the step by step guide on selective colorization — the post-processing technique for creating partial black and white photographs. 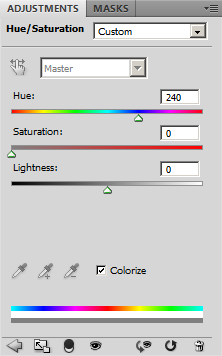 Create New Adjustment Layer: Create a new adjustment layer as in the picture below and select Hue/Saturation from the flyout menu. [Click on half black / half white circle at the bottom of the Layers pallete]. 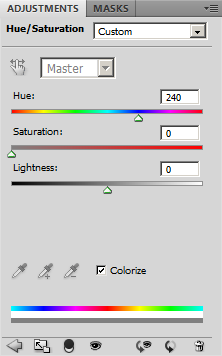 Convert To Black & White: In the resulting Hue/Saturation panel, select the Colorize checkbox and drag the Saturation slider all the way left (to set its value to zero). Looking for some inspiration? Check out the Flickr group Selective Colorization for some creative ideas and get going with your mission of creating partial black and white photographs. Something missing in the list? Feel free to add your style, technique or useful tips for converting color photos to black and white in Photoshop. Very nice article. Can I ask you: What version of photoshop sotfware are you using in this presentation?